The one thing you can guarantee about an English wedding is that you won’t truely know what sort you weather you’ll get for your wedding day until you wake up that morning - and even then you might not be sure! This is true no matter what time or year you get married, even more so with our somewhat mad weather recently, but is especially true in December. ‘What will happen with our photos if it rains all day?’ is a common question from a bride and groom choosing a winter wedding. Fear not! It may be a bit of a dark and damp day but that doesn’t stop you getting some great wedding photos. Hannah and Martin proved this to be the case on the first day of December in the fabulous setting of the Beamish Hall hotel. The Winter Garden room at Beamish Hall Hotel is a tremendous room and looks totally stunning when fully dressed as was the case for this wedding. The warmth of atmosphere in the ceremony room is apparent in the photos, both from the smiles on the faces and the gorgeous wood panelled walls. Huge Christmas trees could be found at several locations around the hotel. These made for beautiful, sparkly and seasonal backdrops to a variety of wedding photos. Porches are really useful, allowing for some wonderful outdoor photos. 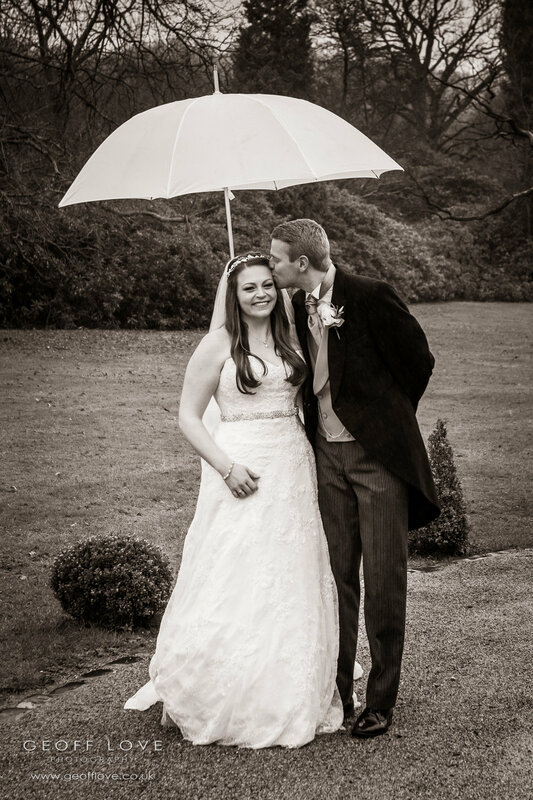 They allow the bride and groom to stay dry even when it’s raining - sadly it didn’t keep me dry though…! For brave couples like Hannah and Martin I always carry a couple of large trusty brollies, so even if it’s raining we can still capture some of the lovely hotel grounds. The bride does need to be a little brave about getting the treasured dress slightly mucky around the hemline but I’ve never covered a wedding yet where this part of the dress hasn’t been pretty filthy by the end of the day anyway - the sign of a good day! And back inside to warm up a little and some fitting, cosy photos. So if you are thinking of a winter wedding and worrying about the quality of your wedding photos - fear not! With an experienced photographer and some up-to-the-minute photo gear there’s no reason you won’t be able to capture some fabulous memories of your special day. If you have any questions about winter wedding photography just get in touch. I’d love to shoot your wedding at Beamish Hall Hotel - or any other venue for that matter. For details of availability and prices please download my brochure or contact me.